You've heard of Cuban cigars, right? As an American, Cuban cigars were something of a legend growing up. There was nothing else that quite occupied the same complex social status as Cuban cigars. The conservative "old guard" of America despised Castro and the rest of Cuba for political reasons, and yet loved nothing more than to sniff out ways to get their hands on authentic Cuban cigars. And Cuba's best cigars come from Valle de Viñales. Or, for short, just Viñales. Viñales has solidly clinched the #2 spot for popular travel destinations in Cuba, right behind Havana. Indeed, travel to Cuba is on the rise and Viñales has quickly made the jump from sleepy agricultural village to bustling tourist hotspot. Normally I do my best to steer clear of these sorts of tourist havens, but Viñales is special. Viñales is actually a protected national park and UNESCO World Heritage Site. 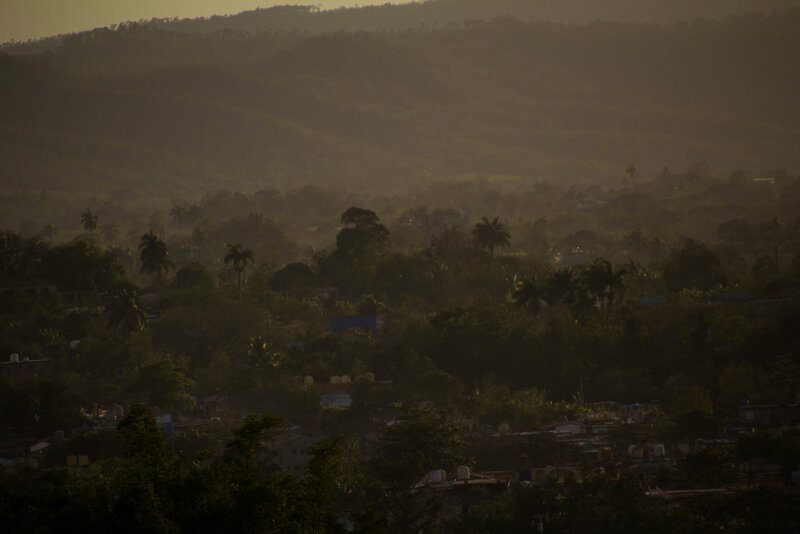 It sits on the northern end of the Cordillera de Guaniguanico mountain range and for most of the colonial period, was uninhabited, except by the last lingering members of Cuba's indigenous population and runaway slaves. It was not until the late 1800s that this area was "officially" settled. It was early in the 18th century that Spanish tobacco farmers from the Canary Islands settled in the general Pinar del Río area. 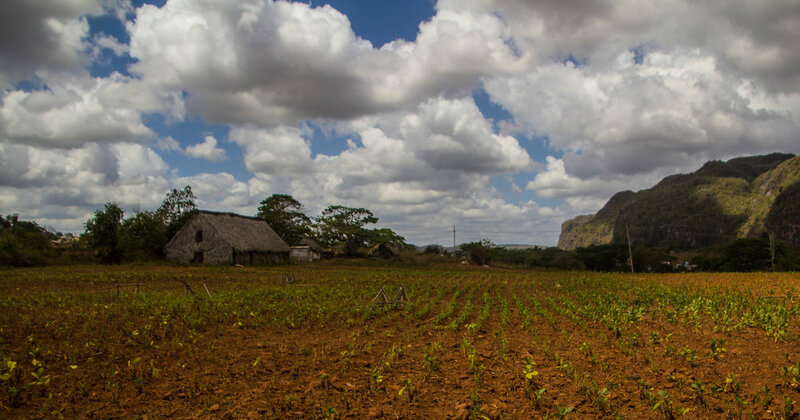 It just so happened that the soil and climate in Western Cuba was perfect for growing tobacco, and it wasn't long before tobacco farming spread across the region. 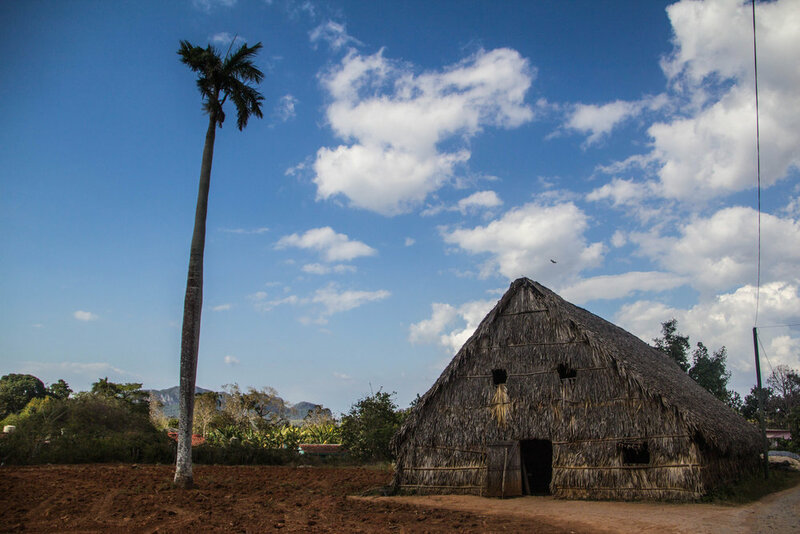 The first ranch in Valle de Viñales was established in 1871 and the rest, as they say, is history. Settlements became towns and it wasn't long before Cuba's railroad was extended to reach those towns. Here's a map showing Viñales, sitting in the heart of the Pinar del Río province. Zoom in! Poke around. This trip had a rough start, for one member of our group specifically: our driver. Joining a few new friends we had made along the way, we got a D.I.Y. taxi collectivo out of Havana for 15 CUC (15 USD) per person. (I explained how to do this in "How To Go To Cuba As An American.") This was the cheapest long-distance trip that we had been able to arrange thus far, so I was in good spirits as I was led to our car. However, when we got to the taxi that was to carry us to Viñales, we were greeted by a driver in a cowboy hat who seemed barely able to function, much less drive a car across Cuba. His eyes were red and sunken, as if he has been up all night crying. His body language was subtle and defeated. It looked as if his whole life had fallen apart just hours before. Setting that aside, we climbed into his car, exchanging quiet exclamations with one another about the sorry state of our driver. "Maybe his wife just left him..."
"Do you think he's okay to drive?" For better or for worse, it wasn't long before we were out on the open road. We sped by farm fields and camione stops as Havana shrank out of view in the distance behind us. However, it wasn't long before our driver pulled off the road at a random gap in the fence. 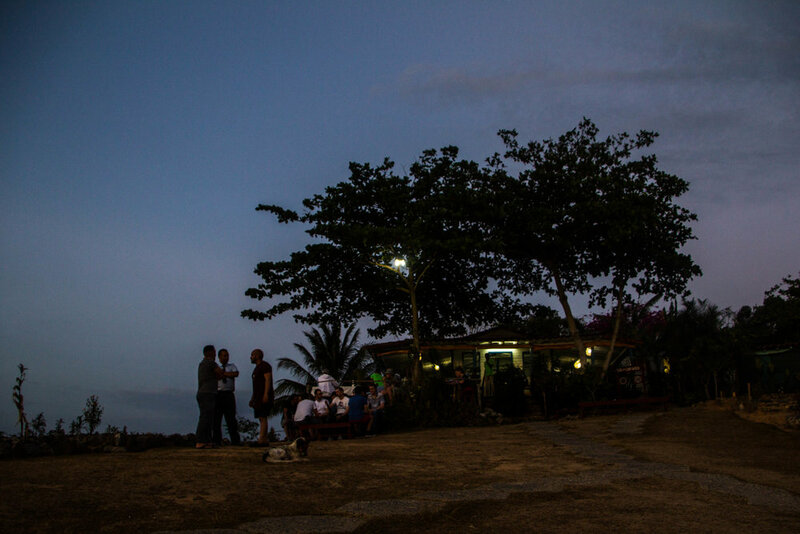 This, it would turn out, was a Cuban rest-stop. There was a small house with an outdoor patio, and home-made signs that hung on the walls listing the prices of a few basic Cuban dishes. Our driver sat down at one of the tables, ordered a meal, and then buried his head in his hands with a forlorn sigh. We were just glad that he was getting some food in his system. While our driver tore into a full-on meal, a group of mangy dogs cautiously walked over to us. In Cuba, it is standard practice to feed and take care of stray dogs, so they all have a very loving disposition towards humans. Traveling through a country where loose dogs were adorable puppies rather than vicious predators was a nice change of pace. Eventually, our driver finished his meal, put his cowboy hat back on, and we all headed back to the car. However, I snapped a few pictures of this rest stop before we left. It was another hour or so driving west with green, picturesque mountains looming in the distance on our right before we finally made our turn off the main highway. Turning onto smaller, 2-lane roads, we immediately got a peak at what real Cuban life is like in rural areas. We sped through small towns, past trucks carrying loads of migrant workers, and past beat-up Oldsmobile cars that seemed to be in no hurry whatsoever. Occasionally I would see our driver's head nod, as if he was fighting to stay awake. This was worrying, but in the end he got us to our destination without incident. Here are a few pictures out the window of our car as we got closer to Viñales. Viñales the town is different from Viñales the national park. That's an important distinction here. 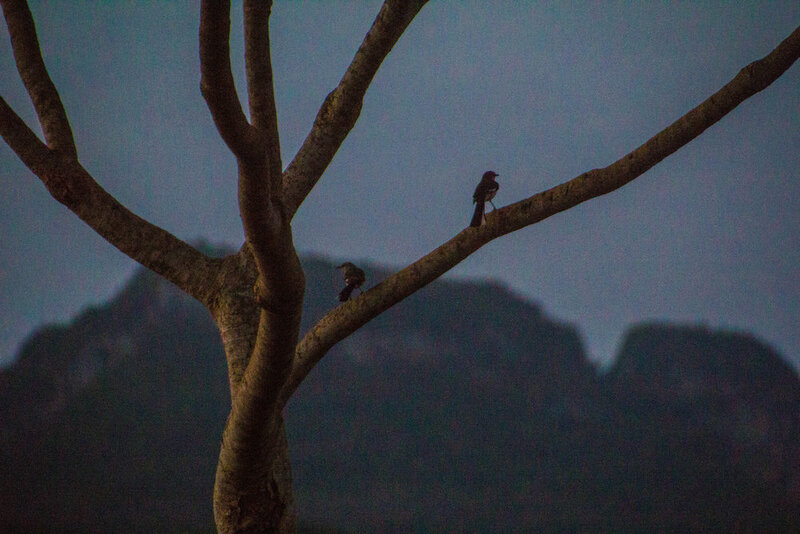 The main draw of Viñales lies in the natural world. Nobody comes here to see the town, but everybody ends up staying in it. 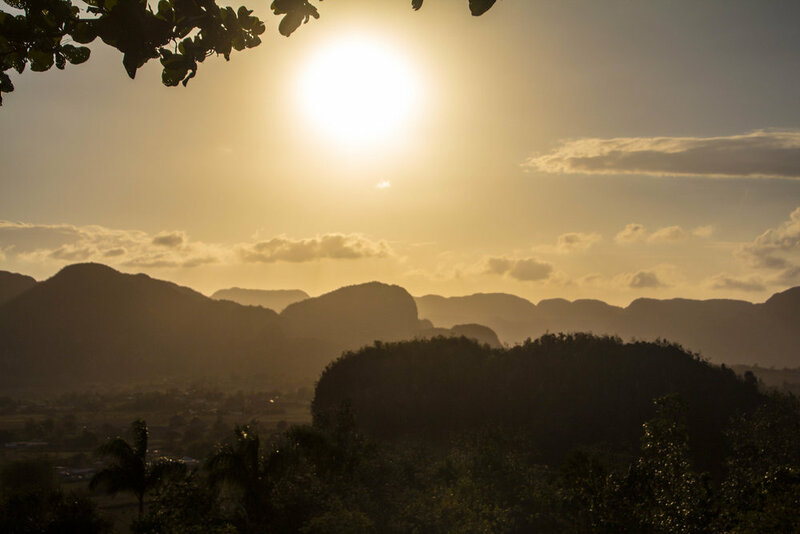 Make no mistake, the town of Viñales exists almost completely for tourists. Yes, there really was an actual town here before the dawn of the age of tourism, but today the identity of that town is has been mostly covered up with layers of commercial development. 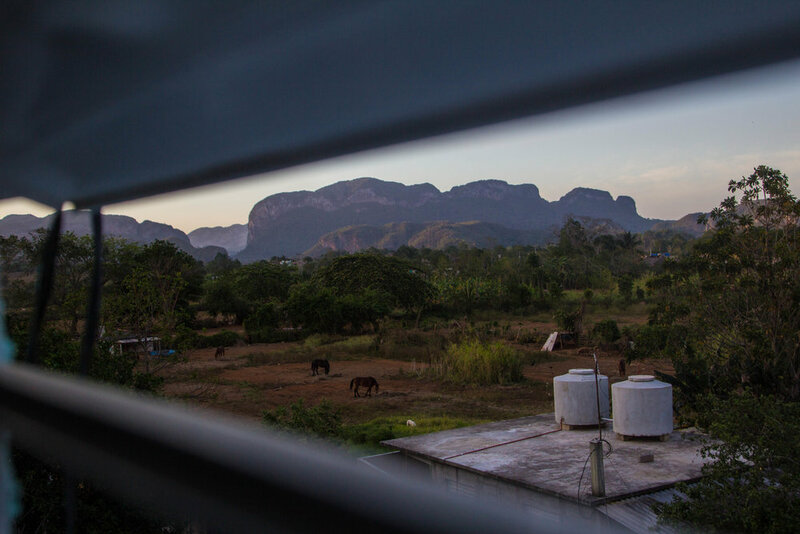 The best way to tap into what Viñales was (and is, at its core), is to stay at what are called "casas particulares," which is Cuba's cross between a home-stay and a B&B. You can book them through Airbnb. This is where you'll get to interact with actual locals, so if your Spanish is decent, you'll probably learn a lot! I'll introduce you to the woman who was the host at my casa particular later in this article. She was the sweetest. Yes, indeed. Viñales has a botanical garden. It's nothing to write home about, but we took a stroll through anyway. Most of it feels less like a garden and more like an urban patch of jungle, but there are some interesting pieces of agricultural land nestled back, away from the street. However, the most interesting part of this little enclave was, for me, the giant rodent pictured below. We affectionately named it after Jeff Goldblum. We had no idea what species Jeff was—it looked like a massive cross between a rat and a gerbil (in a cute way)—but I spent at least 20 minutes feeding Jeff dry, crunchy leaves. He ate them right up. I left the garden wishing I could take Jeff home with me as a pet. If anybody knows what species this thing is, let me know! I'm curious. Anyway, that's all I have to report from the Botanical Garden. Iglezia del Sagrado Corazón de Jesú is the centerpiece of the town of Viñales. That name translates to "Church of the Sacred Heart of Jesus," which is a bit of a mouthful. This church is the biggest landmark in the central plaza of Viñales, and this plaza is known as the hub of most of the nightlife in Viñales. There's not much of it, but this little town has a quite a few little bars and clubs within a 3 minute walk of Iglezia del Sagrado Corazón de Jesú, making it a good jumping-off point for nightly activities. This plaza is actually well-know as a hotspot for salsa dancing as well, if that's the kind of thing you're into. I haven't been able to dig up a ton of information about this church, but it still an interesting place to visit. It's close to everything, open to the public, and it's free to enter all day every day. 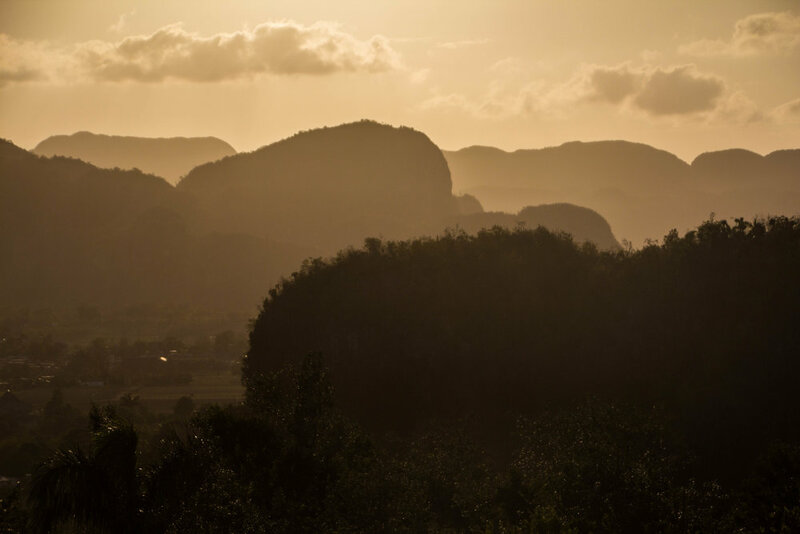 If you're in Viñales, you should definitely poke your head in! Because, like, why not? As we made our exit from the church, the many people standing around the plaza seemed to suddenly gravitate towards the street. 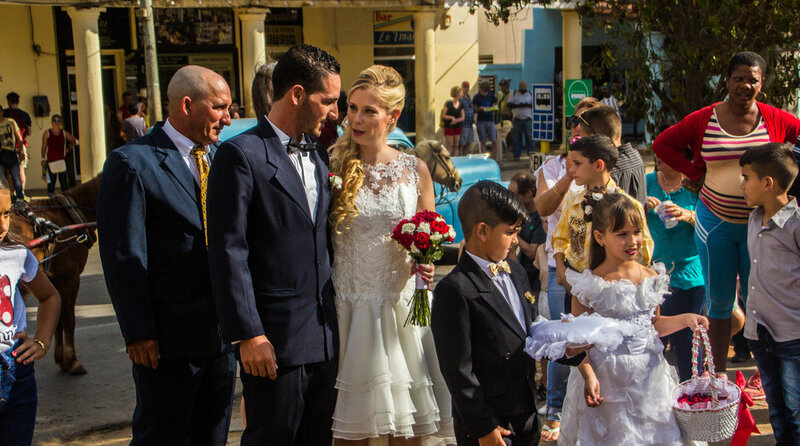 We looked over, and through the gaps in a quickly-growing crowd, we saw a bride and groom making their way up the stairs towards the church from a horse-drawn carriage. The couple paused for a short photo-op and locals (who presumably had been invited to the wedding) huddled in close to take pictures. By this time I had already walked over to throw my own camera into the ring. We weren't the only foreigners who had been attracted by the commotion, but I might have been the one that was devoted enough to push through and snap these pictures. Not a clue who these people are... but congrats to them. So we didn't quite "crash" this wedding, but I definitely made an unsolicited cameo appearance. Anyway, that's enough of the town. Let's get into the good stuff! Viñales National Park is the main attraction here. It's an expansive area featuring prehistoric-looking mountains covered by lush, green foliage with valleys of rust-red dirt filling the space between them. These mountains are riddled with caves, some of which are quite extensive. As recently as the 1800s, runaway slaves would hide-out in these caves to escape their owners. 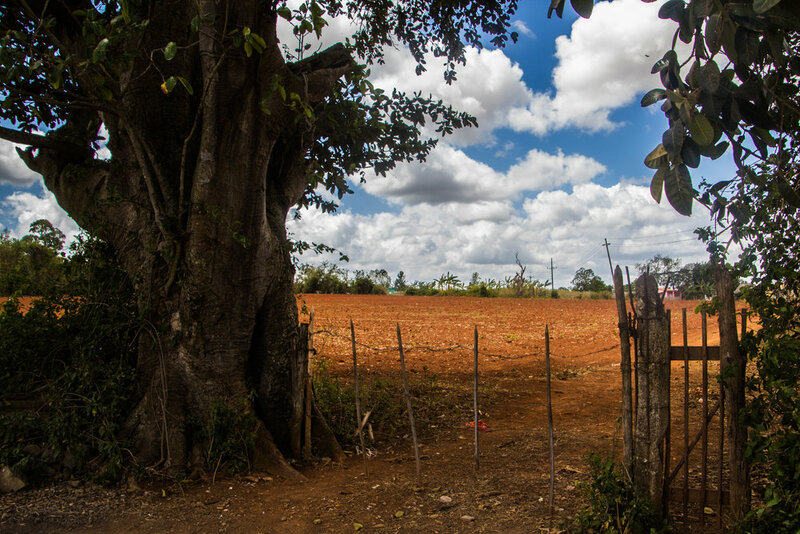 There was little risk of being caught because Viñales was one of the last areas of Cuba to be settled by the Spanish. Fast-forward to the present day and Viñales has become iconic within Cuba, both for the landscape, and for the world-famous cigars that are produced here... but I'm getting ahead of myself. Landscape first, cigars second. 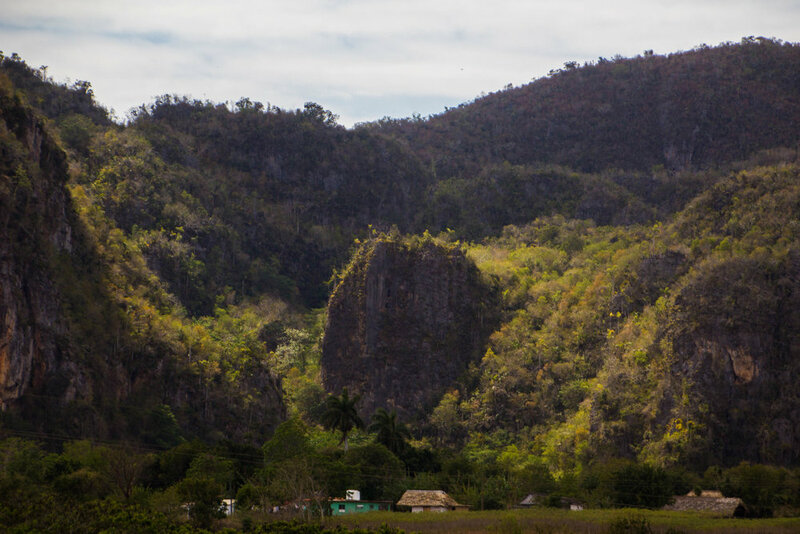 There are 2 basic ways to get around Viñales: on foot or on horseback. If you're on foot, you'll be competing for space with horses, as most of the "roads" that traverse this area are actually horse paths. You can expect them to be uneven and dusty (or, on wet days, muddy). However, what they might lack in refinement, these paths make up for with the promise of adventure. The horse paths of Viñales are virtually never-ending. There is no limit to how far you can walk, nor how much you see. 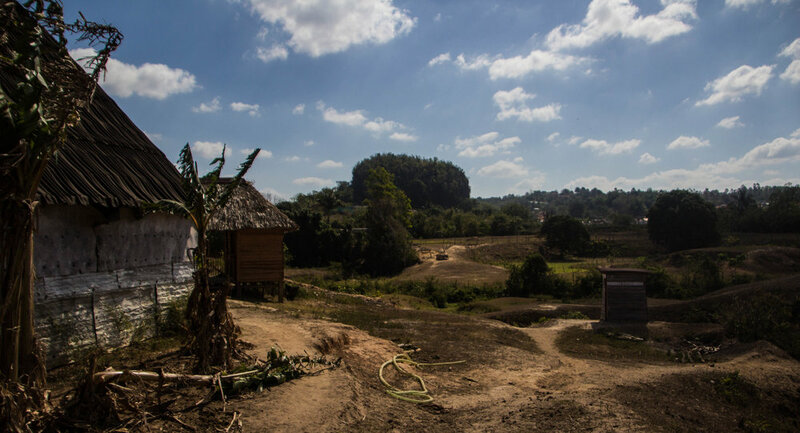 Most of what would pass as "the real Viñales" (at least historically) is pretty far removed from town. Out here amongst the tobacco fields, there are many hundreds of tiny homesteads scattered. Small children watched us through broken windows from dark rooms as we walked by. Any child upwards of 8 or 9 years old was already riding horses around, helping their families with their daily work as if it was nothing. Those kids could ride horses better than I can walk! Horseback riding isn't just for the locals in Viñales—quite the opposite in fact! Riding horses is sort of the "thing to do" here. Honestly, it seemed to me that 90% of horses in Viñales are mostly for tourists at this point, although they have traditionally been mostly an industrial utility. Horses were originally brought to Cuba by the Spanish in the 1750s, and today there are essentially 4 breeds of horse that are present in Cuba: Patibarcino, Cubano de Paso, Pinto Cubano, and Cubano de Trote. From my observations, I can tell you that you'll find more than one of these breeds was present in Viñales, but I'm no horse expert. The only thing that I can really testify to is the fact that they were well behaved and friendly! So how do you make arrangement to ride one of the horses of Viñales? Through your hosts at your casa particular. 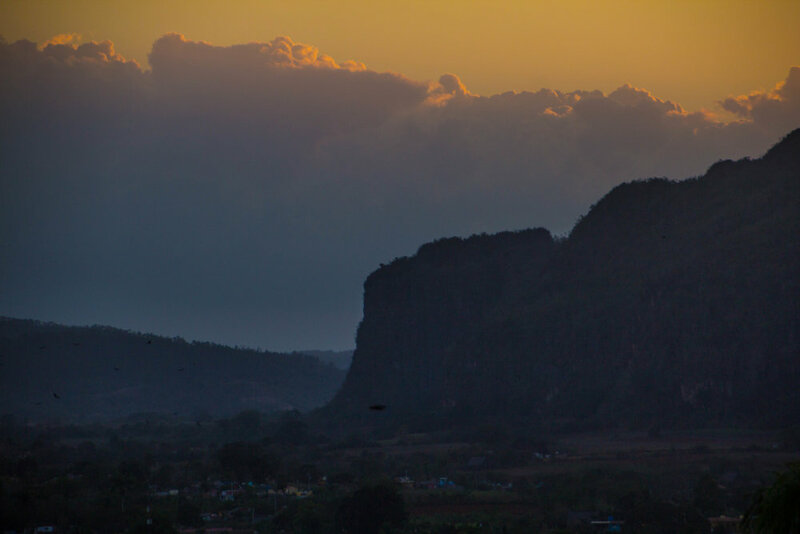 Pretty much anything you could ever want to arrange in Viñales can be done through your host. Family ties are strong in Cuba, so often if you need something, some relative of your host will be standing by, ready to help out. We ended up going horseback riding through our host's cousin, who was just as much a cowboy as any of the men in the pictures above. It cost us 20.00 CUC (20.00 USD) each for a couple hours out on horseback. During this time, we visited a tobacco plantation, a cave, and a house where traditional Cuban coffee was made, as well as a few other drinks, such as sugar cane juice. Each of these had their own costs associated with them. I'll get to the cigars next, but, for example, entrance to the cave was 2.00 CUC (2.00 USD) and I paid 3.00 CUC (3.00 USD) for a glass of sugarcane juice... but I immediately regretted that decision. Almost as soon as I took a sip of my sugarcane juice, my stomach gave an audible gurgle. I knew what was going to happen right away, but I didn't know what the bathroom situation was (although I suspected the worst). I clenched my cheeks and gritted my teeth, but I knew that something inside me was going to get out whether I liked it or not. With an uncomfortable groan, I asked a dude in a sombrero named Pedro where the bathroom was, and he pointed out in the field at a rickety little box. I timidly walked over to the box, pushed the door open, and walked in. There was barely room for me to stand between the make-shift, splintery, wooden toilet bowl and the thin planks that enclosed me. I was hard pressed to find a place to sit that wasn't wet with urine, but I did what I had to do. Oh, and there was no toilet paper—thank GOD we had overpacked and brought some of our own. So let this be a lesson—DON'T drink anything out here, and DO bring your own toilet paper. Here's a GIF I made of that terrible box. After this, I shamefully walked back to my horse, and we were on our way. My horse lurched, swayed, and gurgled its way on through the hot Cuban sun, and I gritted my teeth. More was on the way, but I HAD to get through this ride before anything else happened. Unfortunately, being on a horse in the hot sun is just about the worst place to be if you're having stomach issues, and I wasn't the only one who was suffering—my lady friend (who was traveling with me) had her own crisis that day, but I'll spare you the details... just know that it involved her sprinting out of a cave. But that's all I'm gonna say. Tobacco—this is the cash crop of Cuba. 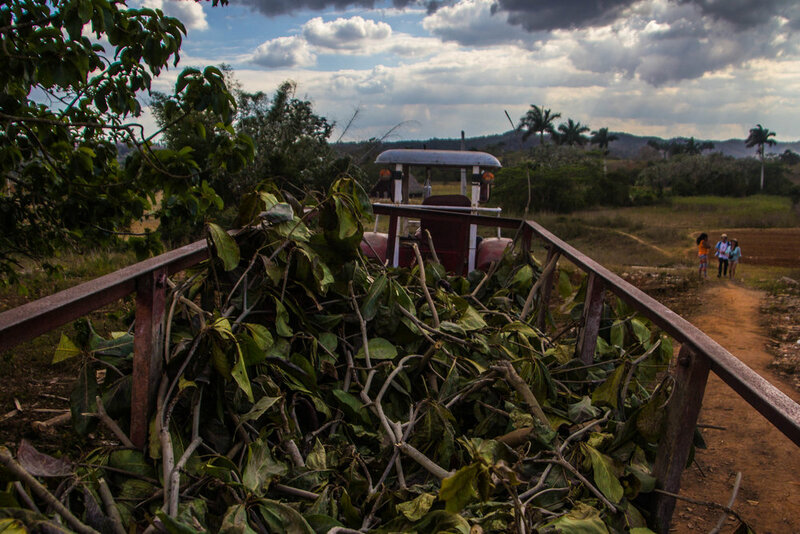 It is grown, dried, and packaged here in Viñales, before being sent away to cigar factories in cities like Havana to be made into cigars. 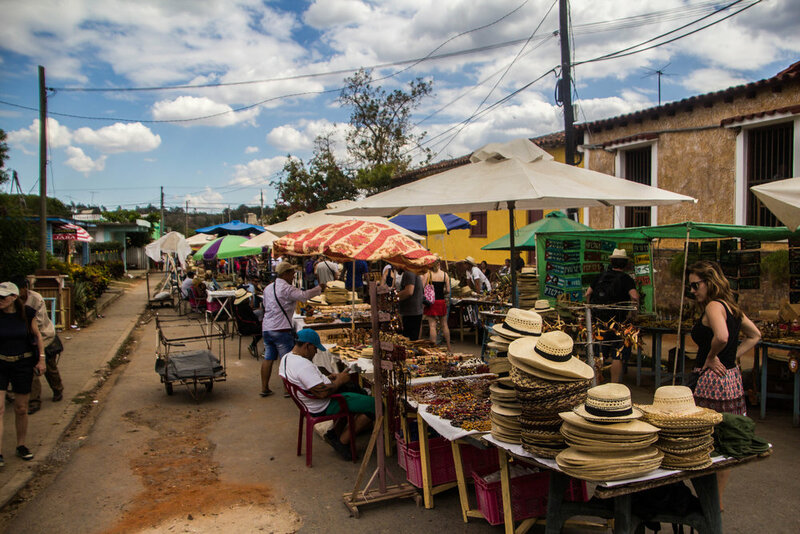 However, some cigars are made right here in Viñales, so there's ample opportunity to sample them, and pick up a few a souvenirs. It's kind of like drinking wine at a vineyard. 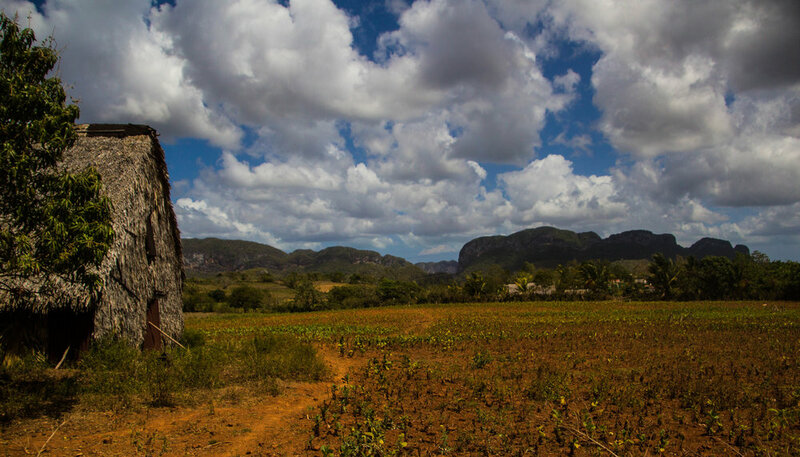 The landscape of Viñales is defined by agricultural tobacco fields. 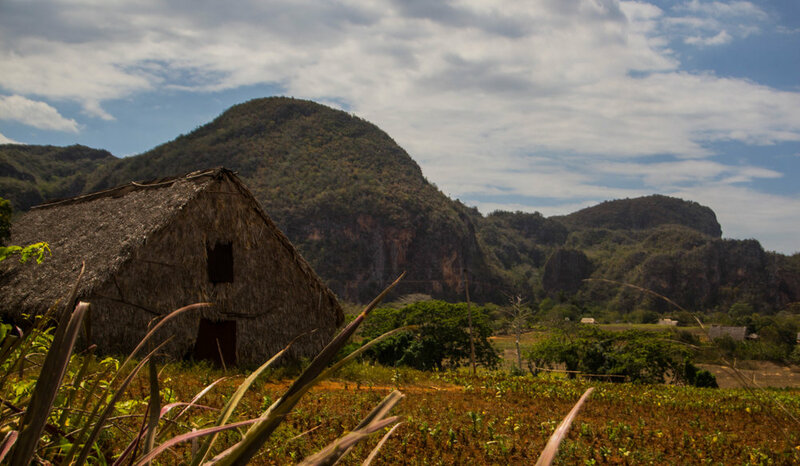 Something like 90% of all tobacco in Cuba comes from the Pinar del Río province, and Viñales is the cultural center of this province. That means that, if you have ever had the pleasure of smoking a Cuban cigar, this is (probably) where it came from. Cuba's tobacco industry is vital to its economic well-being. Last year, tobacco accounted for a whopping 17.4% of Cuba's exports, second only to sugar / sugar confectionery. 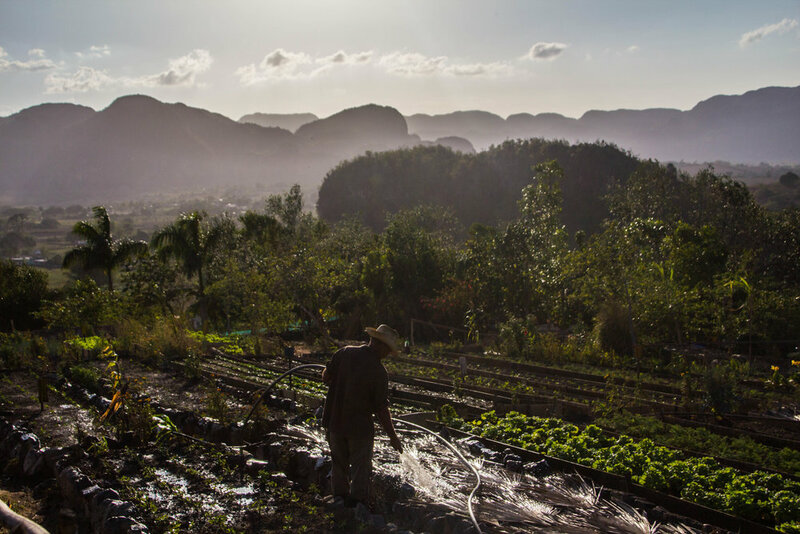 So Viñales is more than just a cultural artifact; it's still a living, breathing, highly-active part of what keeps the lights on for Cuba. And Cuba needs all the help it can get! Here are a few shots Cuban tobacco land, including a nice shot from inside a farmer's house, as well as a random turkey that I found wandering around in a field. 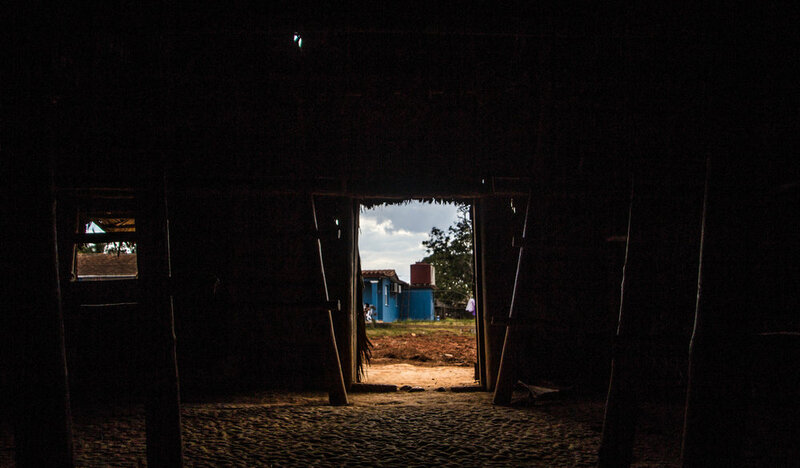 Inside these huts, it's a black-out. Unless the doors are opened, there is zero light in here. And here in the darkness, there are rows of tobacco leaves hanging from the floor to the rafters. Leaves are woven together and hung on these racks until they become completely brown and dry... but it's a soft-dry. It's not like brown autumn leaves crunching beneath your feet; these leaves are even more flexible and durable than they were when they were still green. 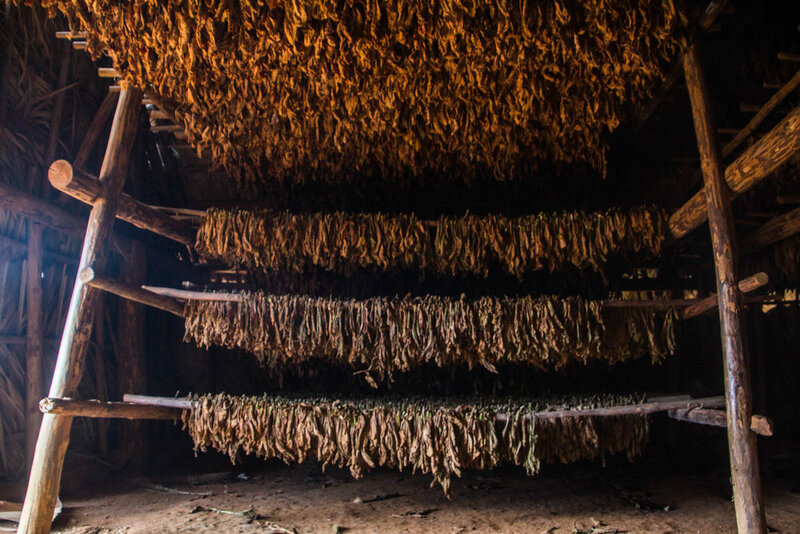 The traditional Viñales cigars are made by rolling these leaves like rolling paper for a cigarette or a blunt. Hanging these leaves up to dry is, apparently, the woman's job, while the men work outside, tending to the fields. Women, I was told, have more patience for tedious work like this, as well as smaller, more delicate fingers. That was actually a less sexist explanation than I had expected... but I still wouldn't want to be the person hanging these leaves up. Click one of these pictures below to enlarge it and you'll see what these women spend their time doing. It looks mind-numbing to me. I'm not usually one for buying souvenirs, but here in Viñales, I felt that I had to make an exception. THEY'RE CUBAN CIGARS! I bought 15 cigars for a total price of 60.00 CUC (60.00 USD). I still have many of them! I've been handing them out to close friends as birthday gifts, etc. The prices of these cigars may have been at a premium, but the experience that accompanied them (as well as my assurances that I was buying the real thing) made it 100% worth it to me. Before I left though, I asked the man that I had bought my cigars from if I could take his portrait. He was so interesting-looking in the low light of this tobacco drying hut! I'm not completely satisfied with my execution of these portraits, but they are still some of my favorites. These photos embody the spirit of this place more than any others I took. Also, post script: this dude spoke like 4 languages fluently. I'm pretty proud of myself that I still even manage to speak Spanish! And I depend on the Internet to help my Spanish stay relatively functional. This guy does not have internet access in Viñales, which makes his linguistic skills super impressive to me. Last, but certainly not least, I have to tell you about the coolest restaurant that I've visited in a LONG time. It's called Finca Agroecológica del Paraíso. In English, that name translates to "Agro-ecological Farm of Paradise." 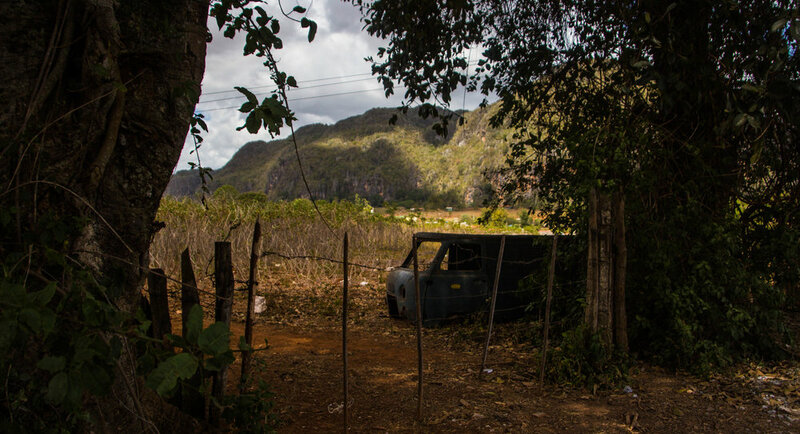 It's a short taxi ride outside of the town of Viñales, but it's worth the trouble for the INCREDIBLE views. I mean, look at these photos! We had it on good authority that this restaurant was the place to be at sunset, so we made sure to get there in time to see the sun slide down past the horizon line, and we were not disappointed. It was the only elevated vantage point that we got of the Viñales Valley during our entire stay, so I wasn't about to let it escape me! I was a fiend with my camera. The actual restaurant was a relatively unassuming little shack sitting on a hilltop, but don't let its looks fool you. This place is the real deal. They basically have one item on their menu: everything. You don't really have the option to choose what you want and don't want—they will serve you one of everything they have. It didn't even fit onto our table! I found myself eating fast just trying to clear up space for the next dish that they brought out. The food was very good, but nobody on earth would be able to eat all of it in a single sitting. Honestly, the amount of food that was given to me at this restaurant could have fed me for at least 3 full days. We had ordered our meal without ever asking the price, so I was starting to panic. I figured that this much food could reasonably have cost upwards of 100.00 CUC (100.00 USD). I knew that this was going to be, comparably, pretty expensive, but I had no concrete information about pricing as of yet. Nervous, I asked our server the price. It was 17.50 CUC (17.50 USD). And that includes my drinks! The menu included some meat (which was amazing, by the way), but for the most, it was a lean, clean, green meal of delicious tropical fruit and vegetables. It was very healthy, except for the huge risk factor of over-eating. So the food was great, but the highlight of the night was their Piña Colada. It was filled with things like honey, cinnamon, and lemon grass, and it didn't hurt that they left the bottle of rum on the table so we could self-medicate. It was the best Piña Colada I've ever had by a mile. 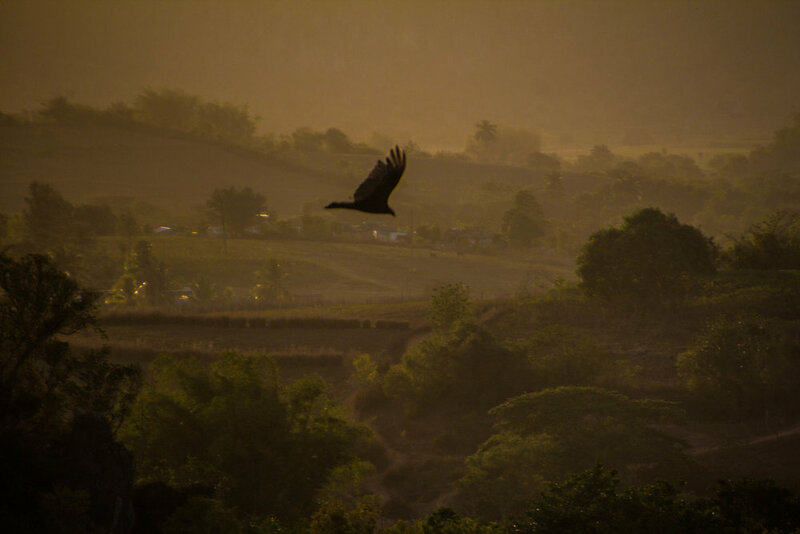 Anyway, to finish this section on Finca Agroecológica del Paraíso, here are a few shots I took during the golden hour, looking down over the valley from my hill-top paradise. I love these shots, especially these first 2 with the eagle flying. Viñales is a stunning place, and if you come here, do not leave without coming to Finca Agroecológica del Paraíso. 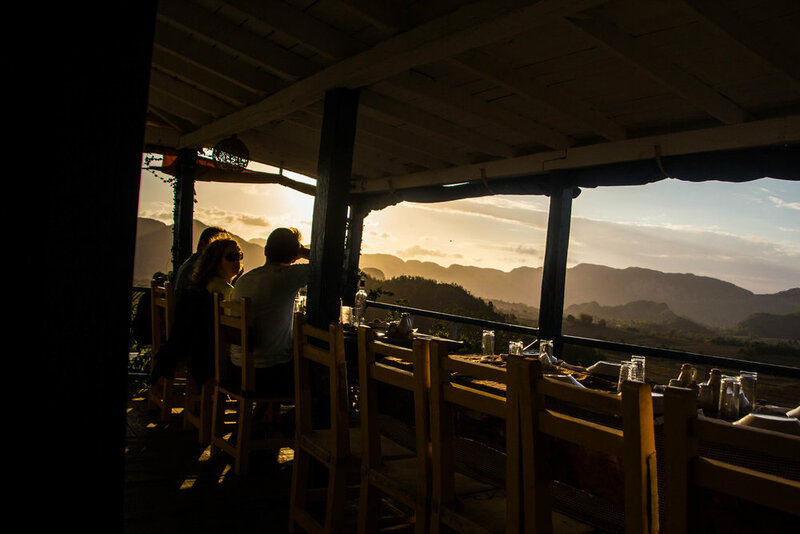 If you are having trouble finding this place, just ask your hosts once you're on the ground in Viñales. That's how we heard about this place. Our host also arranged for a luxurious, open-top Oldsmobile to drive us here, and come back to drive back into town at the end of our meal for a total round-trip price of 10.00 CUC (10.00 USD). It was pretty baller. SO WHO WAS THIS MYSTERIOUS HOST?? UNMASK THEM! Well here she is! Her name is Juana, and she was like my Cuban mother. I would definitely recommend staying with her if you can. We booked with her through Airbnb. Officially, her apartment is listed as "Casa Juana y Michel," and you can find it HERE. Hit her up. I asked her if I could take her portrait before we left, and she happily obliged. I will say that nobody in her house speaks more than a couple words of English. So if you don't feel confident in your Spanish, you might have a tough time communicating with her, but I'm sure she'll figure out a way to help you and serve you amazing meals anyways. Below are a couple photos of her apartment. The picture on the far right, with the mountains off in the distance was the view from our shower. (Those mountains looked much closer in real life.) Our room had great air conditioning, a min-fridge stocked with drinks, and its own bathroom. 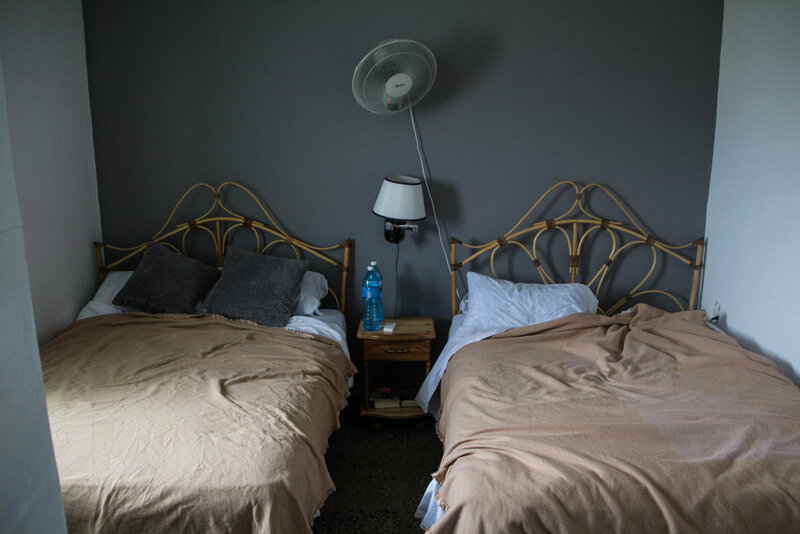 It was private, pleasant, and in a decent location, right on the edge of town so that we could walk right off into the national park. Don't worry—the town is small enough that this really doesn't put you far off from its central plaza. That's it for Viñales! Or, so we thought. On our last morning here, we received word that Cuba was experiencing a sudden and unexpected gas shortage. This meant that taxis were going to stop driving until they could fill up their gas tanks again. We had asked Juana to set us up with a taxi collectivo back to Havana around noon that day, but it seemed like this might have meant that we were stuck. I asked Juana if this happened often, and how long these gas shortages tended to last. She responded (translated) that this was indeed something that was known to happen from time to time, and that the last time it happened, there was no gas for about a week. If we ended up stuck in Viñales for a week, we'd miss our flight, and probably run out of money. Remember that Americans cannot use credit cards or ATMs in Cuba, so if we burned through the cash in our pockets, we were officially screwed. Oh, and remember the fact that there's pretty much no internet in Cuba, making it extremely difficult to get in touch with people back home. This was about to be a huge problem. Well, I won't keep you in suspense. To our relief, after being on and off the phone for about 30 minutes, Juana found us a another taxi collectivo that was about to head back to Havana. Apparently they had a full tank. Our seats in this taxi cost us 20.00 CUC (20.00 USD) per person, which was a tad more expensive than our ride to Viñales had been, but we were just happy to be in a taxi at all. Dodged a major bullet here! We arrived back in Havana just in time for Easter... but we didn't celebrate Easter in the most conventional way. Stay tuned! And while you're waiting, take a listen to one of Cuba's most classic troubadours.